Description: Totally black. Orange swelling on upper mandible. 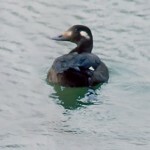 Female is dark brown, with dark crown and nape, and pale face and throat. Behavior: Mating display consists of male splashing and whistling around female. 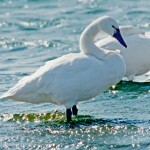 Habitat: Migrants found on lakes, reservoirs, and larger rivers. Winter on coast. 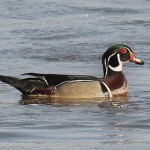 Where in Nebraska: Rare migrant. Usually seen during fall, in scattered locations across the state. 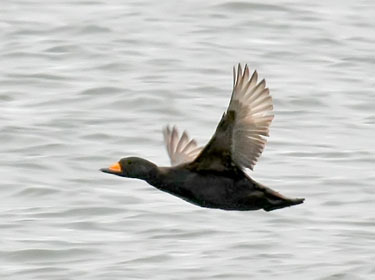 Rarest of Scoters in the state. Fun Facts: While performing the “wing-flap” display of splashing around in the water, they will thrust their head downward making their neck appear to be broken.